Home DIY Projects	New Whirlpool Kitchen Appliances! Yay! Our new Whirlpool kitchen appliances are here! And installed. Double Yay! Come see what we chose…. A few weeks ago we finally bought some new kitchen appliances! We were especially thrilled since a few of them had been on the blink for some time. The dishwasher no longer cleaned the dishes. Plus, most of the plastic wheels had fallen off and melted on the hot coils making it difficult to pull out the bottom rack. And the cooktop had a broken igniter switch. All of the kitchen’s appliances were over 14 years old. Time to upgrade! Our old appliances were by GE in solid black. They looked great and worked great in the beginning but after all of these years, they were starting to show their age. We thought about switching all of the appliances out for stainless steel like we have at the lake house, but we didn’t want to replace all of them at once due to cost. We replaced the refrigerator about a year ago. This year we decided to replace the rest of the appliances with the exception of the double wall ovens. They still work great so it’s hard to justify the added cost. I wish I could just buy new stainless handles! The new dishwasher is so pretty! It is the Whirlpool Model WDT720PADE in Black Ice with Stainless Steel handles. The inside is stainless steel as well with the silverware caddy on the door. This weekend my husband added the metal brackets that secure the dishwasher to each side of the cabinets. Now it’s a perfect fit! I love the polished look of the shiny black and stainless steel. And it works great! The old microwave didn’t want to come out. It took the two installers plus my husband to remove the old one. But, it finally came out and they were able to fit the new one in its place. 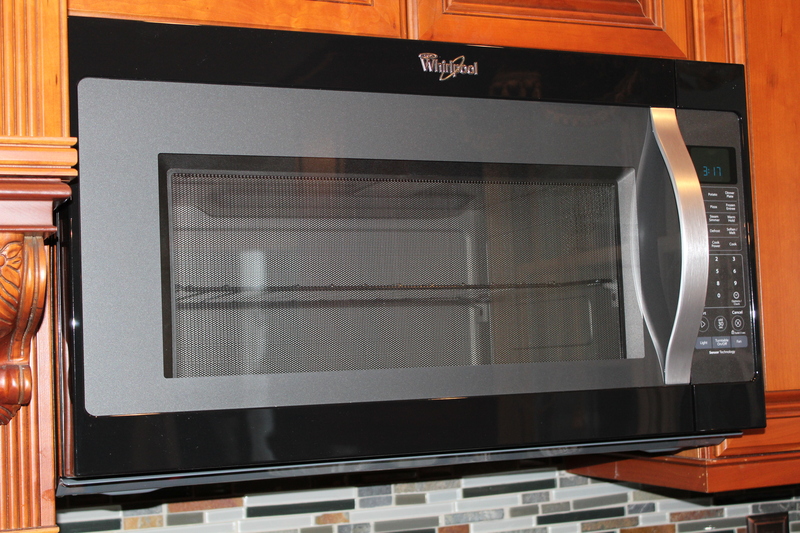 It is the Whirlpool Microwave Hood Combination Model #WMH53520CE-4 Black Ice with a stainless handle. The new one has a light gray face surrounded by a black frame. It’s very sleek looking. (why do microwaves come with a metal rack then recommend you remove the rack prior to use?) As an added bonus, it sings a little song when your coffee is done! The old black one is on the left and the new one on the right. Much lighter and brighter! The cooktop turned out to be the biggest challenge. The old GE model was flatter and more shallow than the new Whirlpool model. And the new gas line is closer to the cooktop unit and therefore interferes with the drawer underneath. The drawer itself still fits but no longer closes. My husband tried cutting down the drawer and slides, but it still didn’t close properly. He ended up ordering a custom size drawer but meanwhile just put the front of the cabinet drawer back in place until the new one comes in. It’s always something, right? Our cabinets are dark cherry and our countertops are the Ubatuba Black Granite. When we built the house 14 years ago we loved it. But now it’s a bit dark for my taste. Or, more likely I’m just tired of it after all these years! I’m thinking the new mix of stainless steel and black will help lighten it up some. My next project may be taking down the curtains and blinds and painting the kitchen a lighter color.